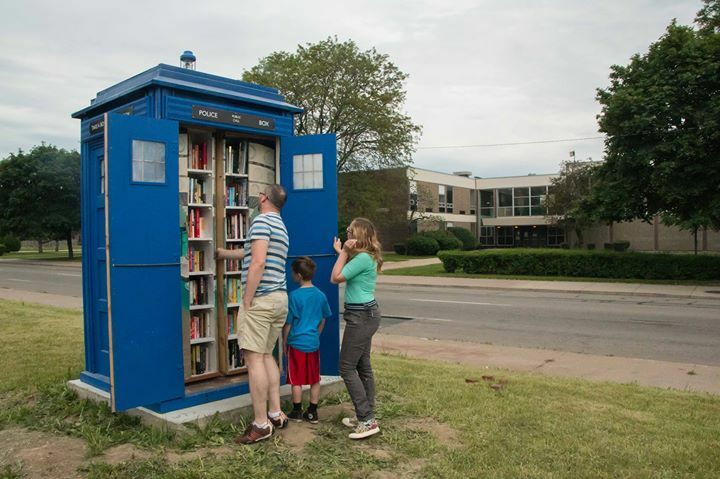 Detroit Now Has a TARDIS-Shaped Library #SciFiSunday « Adafruit Industries – Makers, hackers, artists, designers and engineers! Between its forthcoming Robocop statue, and a recently installed public borrowing library shaped like Dr. Who’s famous police-box-time-machine, the TARDIS, Detroit is becoming one of the dorkiest cities in America. As Parade reports, the homemade TARDIS was recently installed on Detroit’s Warren Ave. The life-size prop replica, is the work of local Dr. Who fan Dan Zemke who also runs a branch of the youth reading program, Reach-Out-and-Read. Zemke combined his two passions to create the new mini-library. Along with the help of his father, Zemke was able to custom build the TARDIS over just a few months.